In the VISL programs, menus, buttons and feedback are in English. Training part of speech is important. Here follow links to four different games. Paintbox (Máladoassa) - paint nouns, verbs and other words. Wordfall (Sátnegahččan) - Nouns, verbs and other words should rall down at the right place. Shooting Gallery (Báhčinspeallu) - shoot nouns, verbs and aother words flying over a nightly sky. Labyrinth (Labyrinta) - hurry through the labyrint via the correct part of speech. Don't let the ghost eat you! Read about our parts of speech. These games help you do sentence analysis. Syntris - subjects, objects and other constituents shall fall down on the right place - the game reminds of Tetris. 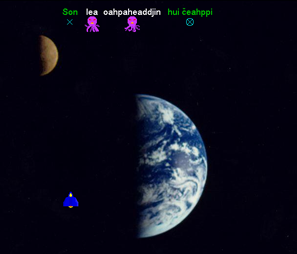 SpaceRescue - you shall find out what word belongs to what sentence constituent, and rescue them with a space ship. 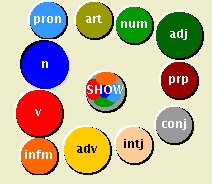 Sentence analysis - Draw syntactic tree structures in interaction with the computer (suitable for high shcool, college and university). Killerfiller - write the appropriate form of the word in its sentential context. If you want to adjust the games to the pupils' level, you might want to look at our sentence corpus.